Baw Wow! 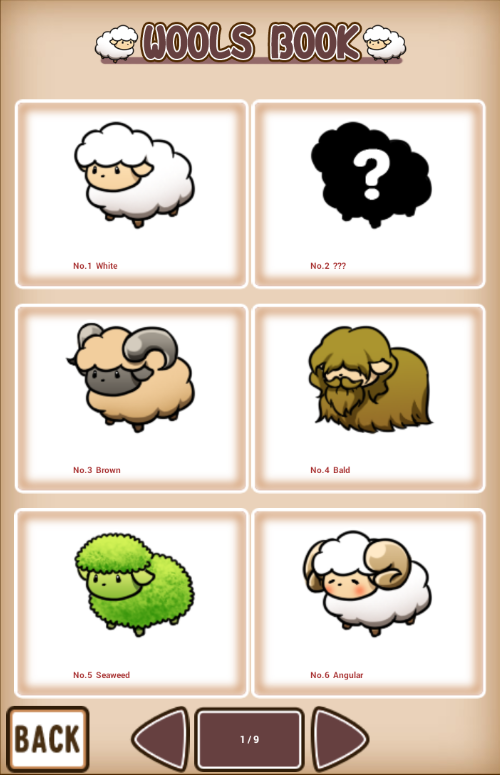 sheep collection is a sheep breeding and shearing simulator casual game published by Cross Field Inc. It allows you to grow the wool on the sheep’s back, which you can eventually shear and earn coins with. The goal of the game is to fill a picture book. Very cute graphics! Especially the startup screen is very cute. The variety of sheep all look interesting and of course the dog is cute too. The music is pleasant to listen to, the sounds are basic but do their job. 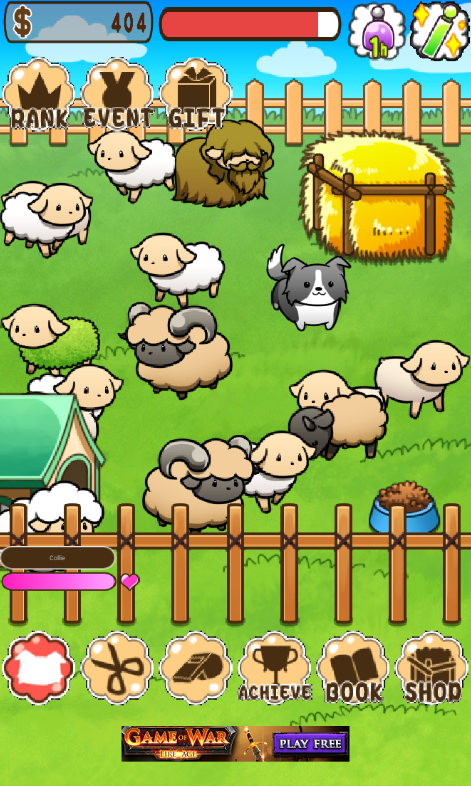 In the game, you have at your disposal a small strip of land with on it the following: sheep, a sheepdog, a dog house, grass and a food bowl for the dog, with a fence around it. Your sheepdog is there to protect your sheep from the wolf; the wolf comes by every now and then and wants to attack your sheep. Your sheepdog, if you petted it enough and gave it some food, will protect the sheep. Upgrading your dog house will also protect your sheep better. To let the wool grow, you give your sheep a hair tonic. There are several types of hair tonic and I have sadly not been able to figure out whether using different hair tonics affects the ‘style’ of wool growing on the sheep. What does have an effect, however, is your grass and your fence. Your fence allows wool to grow quicker and the grass increases the chance of rare wool to grow. Anyway, the wool will grow and some of your sheep might look different: that’s the idea. You will continue taking care of your sheep and fill your picture book with pictures of all possible sheep. Baw Wow! 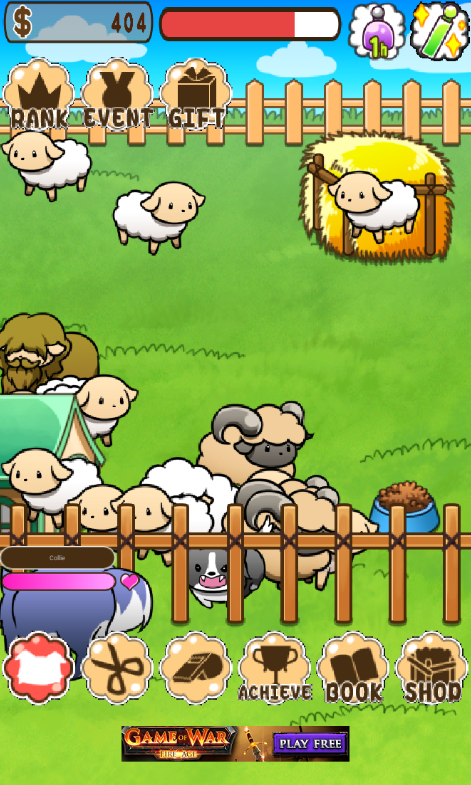 Sheep Collection is a fun and entertaining sheep breeding game, however getting that wool to grow and petting the sheepdog in order to have it protect your sheep is really all there is to it. You can buy some decoration for your field and upgrade current items (fence, doghouse, grass) which adds to your sheep’s protection/wool growth. All in all, entertaining but not that exciting or engaging. It’s not a bad game, so I think a passing six should be a suitable rating for it.